The following example demonstrates how to connect to a public web service, retrieve weather information in XML format and display the current information (e.g. : temperature, humidity, etc) from a given location on the screen. You may be asking: why would someone considering doing this from an HMI such as InTouch Machine Edition? Applications such Smart Irrigation (Saving water with Smart Irrigation System - allowing remote control of the irrigation system to facilitate the management of the water network. ), Smart Agriculture (control climate conditions to maximize the production of vegetables) are ideal targets for such an application. More about InTouch Machine Edition? InTouch Machine Edition is a customizable HMI designed specifically for embedded and OEM applications where a small footprint and cost effective price are paramount. 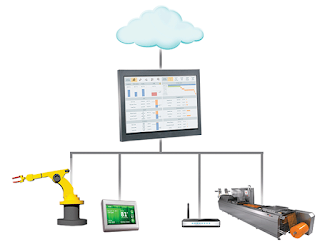 The compact footprint makes it the ideal HMI for IIoT applications. It can deploy and run on small panel PCs, embedded devices and machines while offering remote HMI access on smartphones and tablets without any software installation. Seamless Integration with Wonderware portfolio offers (e.g. System Platform, Historian, Wonderware Online) a natural extension for Wonderware customers looking to take advantage of IIoT applications.